theAd>> These are a pair of totally unique, "far out" leather shoes with snake skin trim in the back. The bottom sole is made of rubber. 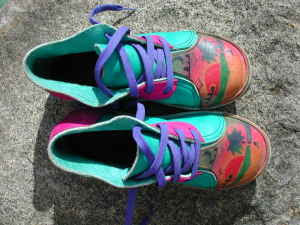 They are very colorful and have a tropical design of a palm tree and sunset on each front tip. Definitely eye catching. A conversation piece. Comfortable to wear. Artistic. A collector's item! I only wore them a couple of times, so they are practically new. Size: 8 for man. I paid $150 when new. I think we all commend the optimism it takes to post these for sale. Here are the two things you really need to do. 1. Put them in a bag. Take them to a local thrift store. Hand them to the donation taker. Turn and run. Don't look back even if she is yelling "SIR, SIR we can't take these they are too ugly!" Do this TODAY! Halloween is Friday and that is the only way you could donate them in good conscience. 2. Stop shopping while you are drunk.